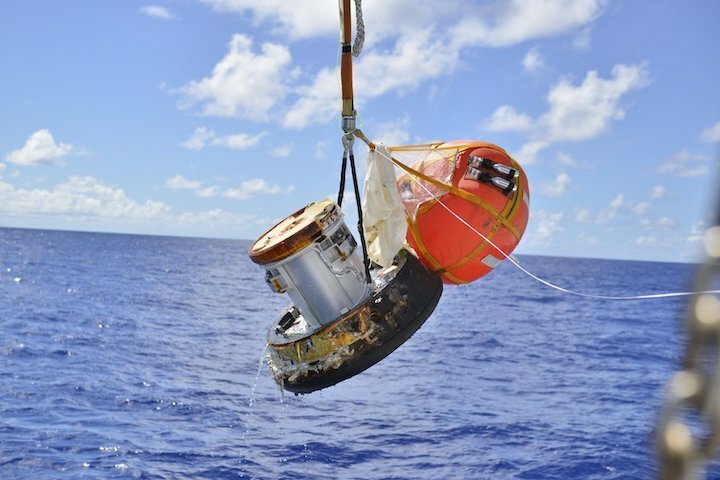 The HTV Small Re-Entry Capsule is pulled out of the water and onto a recovery vessel after it returned to Earth on Nov. 10, 2018. After leaving the International Space Station last week, a Japanese cargo spacecraft dropped a small capsule of science experiments into the Pacific Ocean before falling to its fiery demise in Earth's atmosphere. Before it was intentionally incinerated upon reentry, the HTV-7 cargo resupply ship spent 41 days at the International Space Station. The Expedition 57 crew used the station's Canadarm2 robotic arm to send it off on Wednesday (Nov. 7). On board was the HTV Small Re-Entry Capsule (HSRC), a small cone-shaped capsule that would become the first Japanese spacecraft to bring experiments back to Earth from the space station. Following a deorbit burn, the HTV-7 entered Earth's atmosphere on Nov. 10 at 4:14 p.m. EST (2114 GMT), and the little capsule separated from its mothership and began its own descent. It floated down to Earth via parachute and splashed down off the southern coast of Marcus Island, the Japan Aerospace Exploration Agency (JAXA) tweeted. The capsule's contents were then brought to JAXA headquarters at the Tsukuba Space Center for analysis. 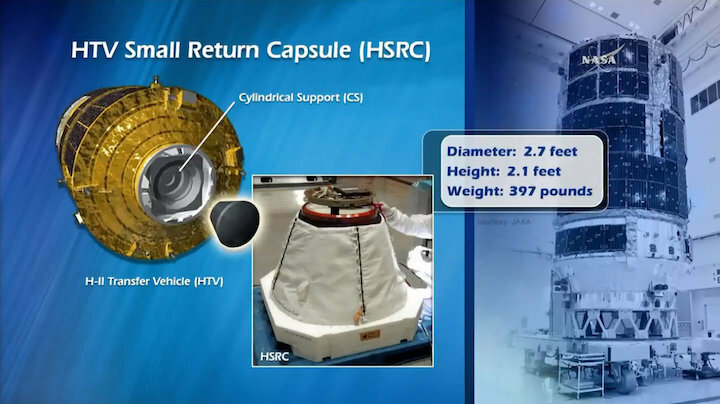 This NASA diagram shows the location and size of Japan's HTV Space Return Capsule on the HTV-7 cargo ship. The small capsule successfully returned experiment samples to Earth on Nov. 10, 2018. Inside the HSRC were samples of protein crystals grown at the space station. These microgravity-grown crystals can be used to study the structure of the proteins in greater detail than is possible on Earth, and understanding their structures could help researchers develop new pharmaceutical drugs, NASA officials said. During this mission, which was the first test flight of the HSRC, the little capsule demonstrated its flight capabilities as well as its ability to protect its internal payload against the extreme temperatures of re-entry. "We expect that these efforts will lead to securing flexibility in our future space flight activities," JAXA president Hiroshi Yamakawa said in a statement. With a successful test mission under its belt, JAXA can start using the HSRC to bring science experiments back to Earth using a Japanese aircraft, rather than having to hitch a ride with SpaceX's Dragon capsule — the only cargo spacecraft built to survive re-entry. 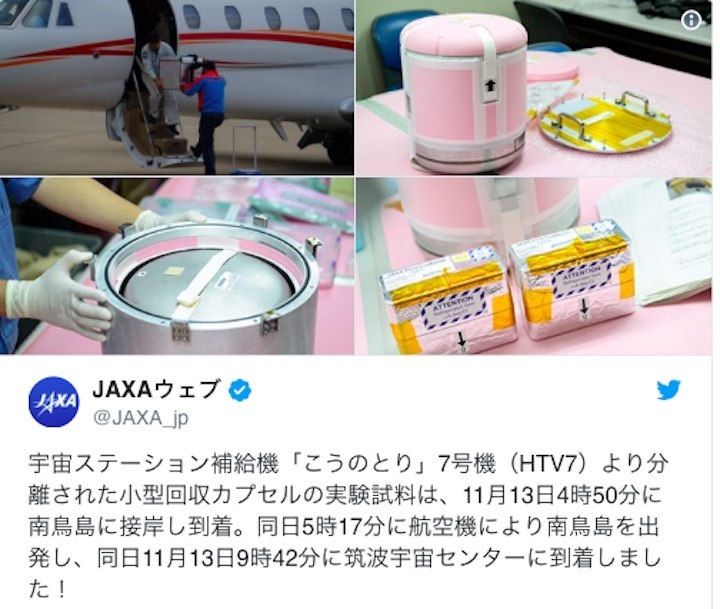 JAXA's next HTV cargo resupply mission is scheduled to launch to the space station in mid-2019.